Aeration prevents compaction of soils by regularly removing plugs of soil and turf and allowing the entry of air, water and nutrients. The service is performed mechanically, as the machine moves over the lawn it’s tines puncture holes into the turf and pull out plugs of turf, leaving space for air to enter and encourage new growth. This also provides space for any new seed to nestle in. Mechanically removing plugs severs the roots of the grass plants which stimulates new root growth that will fill in the newly made spaces. The plugs, or cores, are then left on the surface of the lawn to decompose and contribute organisms back to the turf, aiding in the breakdown of organic matter. What does it do to help my lawn? Aeration is a very important yet often over-looked service that is essential for maintaining a healthy lawn. Aeration assists us in controlling a number of problems that can arise in turf grasses. Most importantly, it aids in preventing compaction of soils. Compacted soils contribute to a large percentage of problems that arise in lawns that are very often mistaken for insect damage, disease, improper watering or lack of fertilization. Problems begin when top several inches of soil become so dense and compressed that it prevents the circulation of air, water and nutrients to the roots. When soils are compacted, this stresses the grass plants which decreases their ability to successfully compete with weeds, and it slows down recovery time when injured. Compacted lawns will eventually need renovating. Compacted soils also contribute to the amount of thatch, (the layer of dead grass and organic matter that lives on top of the soil). The compressed soil is lacking in oxygen and therefore becomes inhospitable to thatch-consuming organisms such as earth worms. They leave the area and the thatch layer continues to grow. A heavy thatch layer will eventually contribute to the demise of a lawn if not properly cared for. 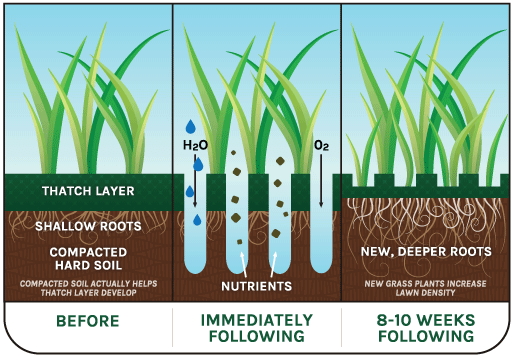 Increasing oxygen levels in the soil stimulates root growth and increases activity of thatch-consuming organisms. Aeration and over-seeding directly contribute to the success of a lawn the season after it has been performed. Can I wait until Spring? 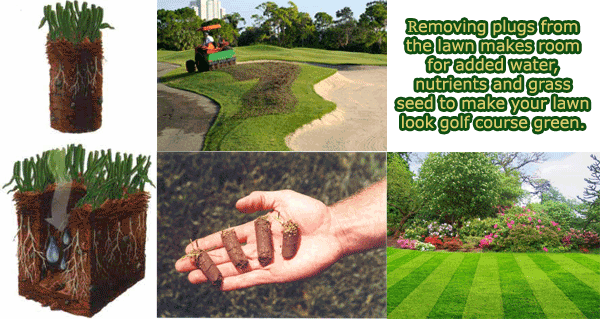 For best results, aeration and over-seeding services are offered exclusively in the Fall. Once we’ve reached September, the weeds are no longer producing seeds that can corrupt the existing turf. We are also concerned about excessively-hot temperatures that can unnecessarily stress the turf. If you are interested in obtaining a quote for these services at your property, please contact Rebecca or Evelyn in the Winterberry office at 860-378-0071 and get your lawn scheduled today.